Folders for school, work or other projects can all use some decoration, right? Or a picture album! Because you can only draw on the outside, I suggest you using a paint marker. This is light, water and abrasion resistant after it dries. 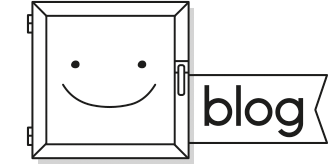 Check out all the inspiration posts over here and don't forget to tips and info here. 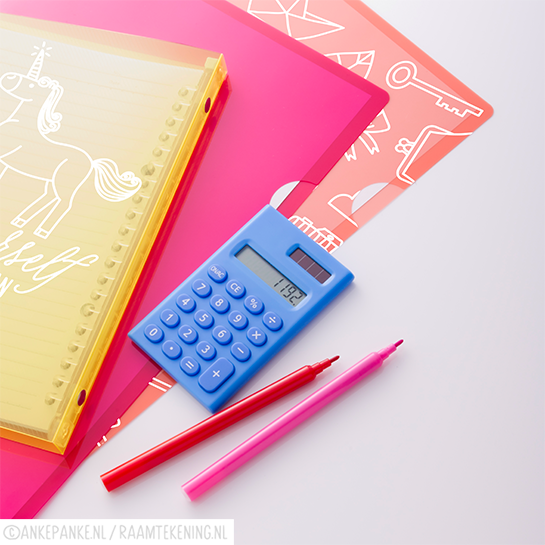 Window drawing designs: Unicorn quote , Doodles I and Baby doodles. I recently moved in with my boyfriend and he asked me to design a window drawing for the kitchen window. He wanted a street, specifically the Putstreet (where we live). 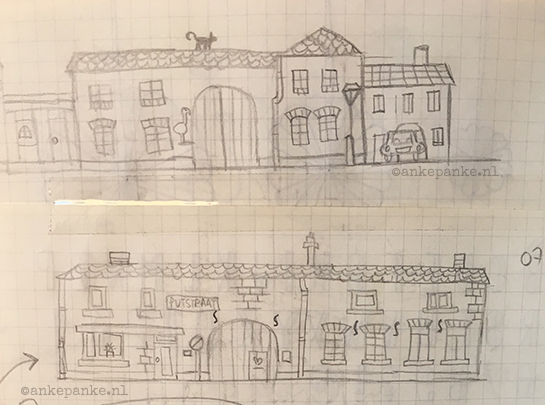 I thought it was a fun challenge, so first I sketched the houses using Google streetview. 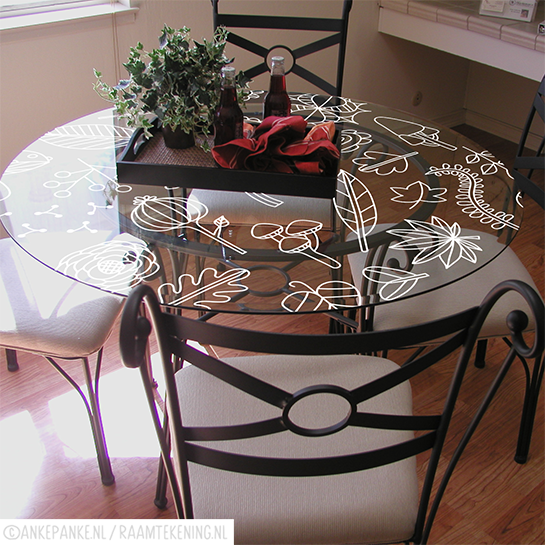 Then I digitized them and turned it into a printable (following the size of the kitchen window). It turned out to be quite a big window drawing. Next I cut it out and put the pieces together. Glass tables. You can draw on those too! This a themed setting for a dinner. How awesome would it be if you drew all over the other side in stead of 'just' a tablecloth? 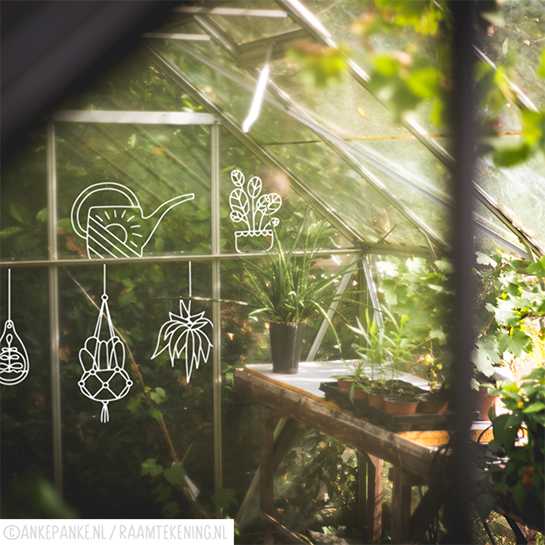 Maybe not completely season appropriate, but if you have a greenhouse in your garden? You can draw on that too! Or maybe you have a small one. Decorative or actually functioning. 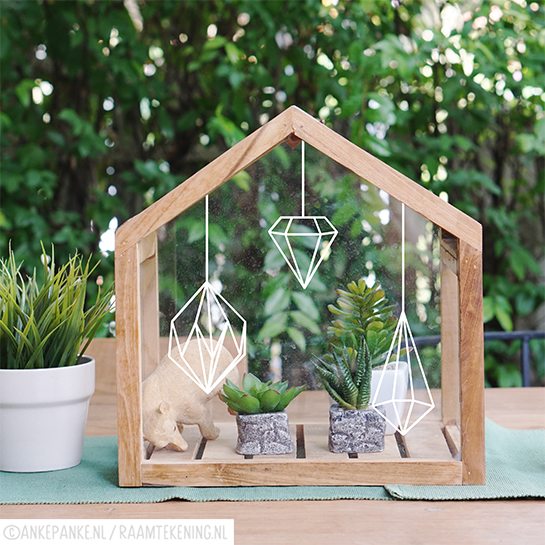 If there are plants on the inside, it's probably best to draw on the outside. Raamtekening ontwerpen: Paper decoration II en Plants I. 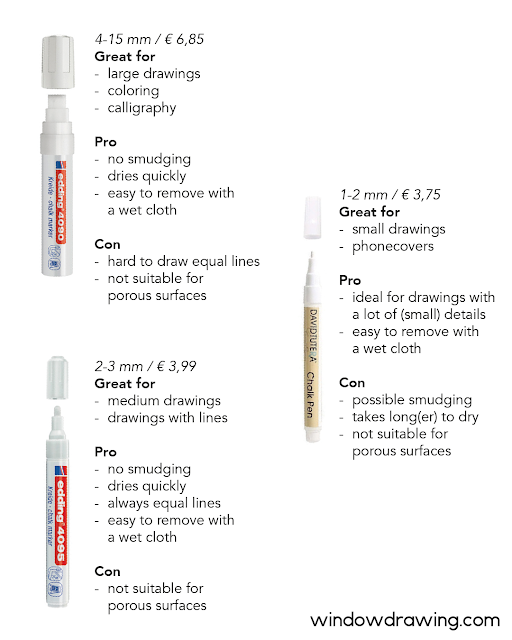 For these surfaces you'll need other markers, because chalk markers are waterbed and will run after one hot shower. Use a paint markers, these are water-, abrasion-, light- and heat resistant after drying. 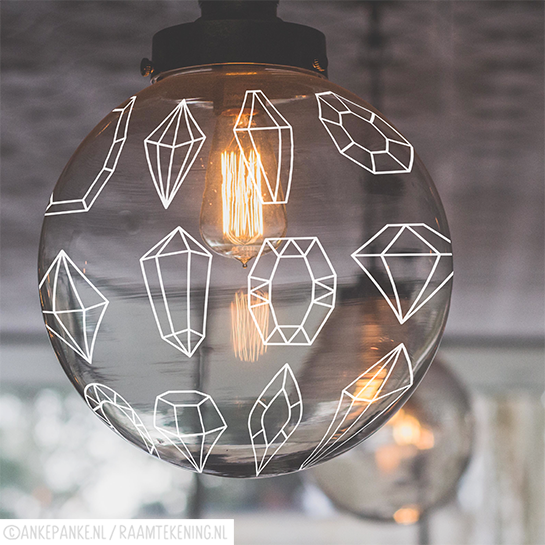 Raamtekening ontwerpen: Circus en Hexagon pattern. 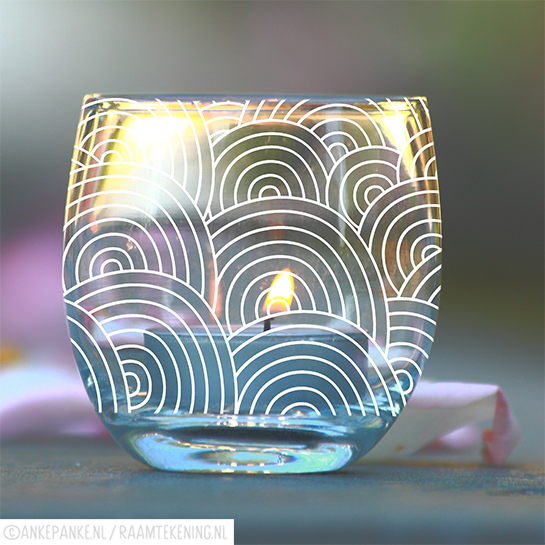 Bored with your simple tea light or lantern? Spruce it up for the holidays or a different, fun occasion with a happy drawing. Use a paint markers, these are water-, abrasion-, light- and heat resistant after drying. 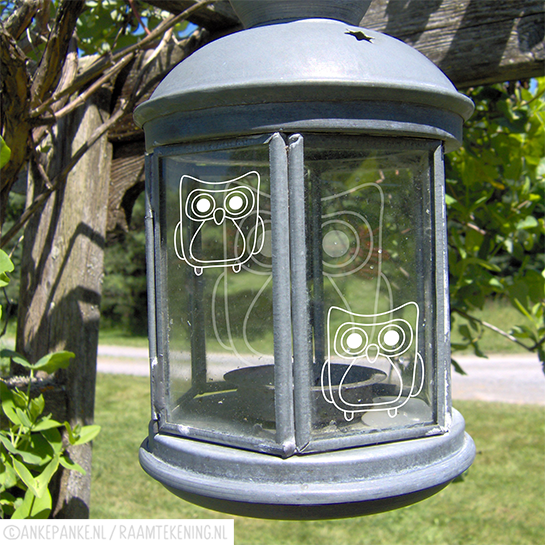 Raamtekening ontwerpen: Circles pattern en Owl. Ok, technically this is still a window. But from a car! 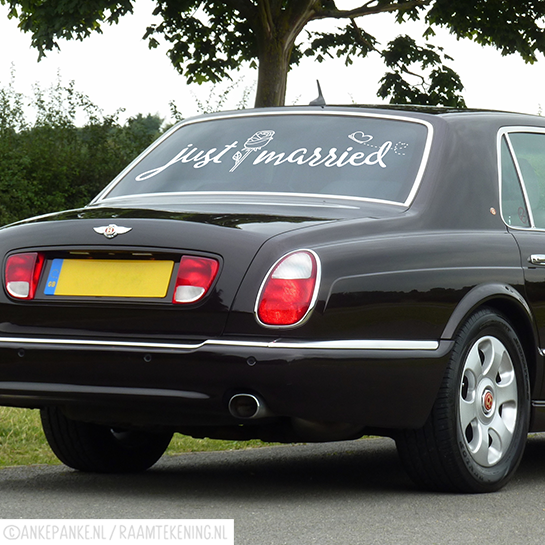 You probably know the just married drawings, but you can decorate them any time you want! Are you having a party? Or just in a festive mood? There should be flags! 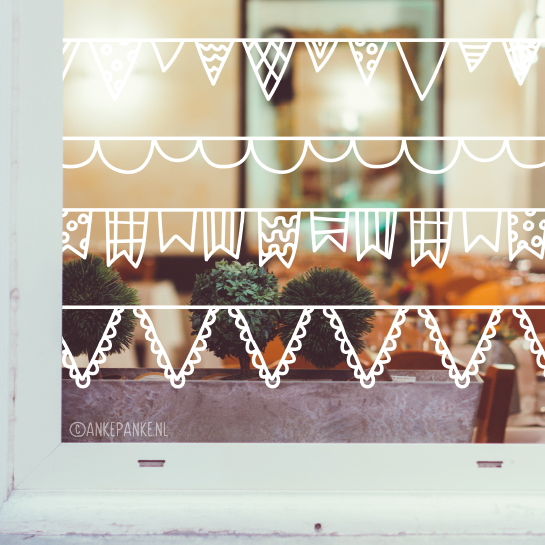 Don't just draw on one window with one string of flags, mix and match the different designs and it's ok to fill the complete window! At the Window drawing shop you can get a fun flags freebie. Do you have a nice, big lamp above your table and getting kind of bored with it? Tip: you can draw on it! Use a paint markers, these are water-, abrasion-, light- and heat resistant after drying. Make sure the light has been off for a while before you start drawing, so you don't burn your fingers. Raamtekening ontwerpen: Houses I en Crystals. New year, not chances and making new plans. Already starting to get skeptical if you're actually going to follow through on them? Draw an inspiring quote on your window go motivate yourself. 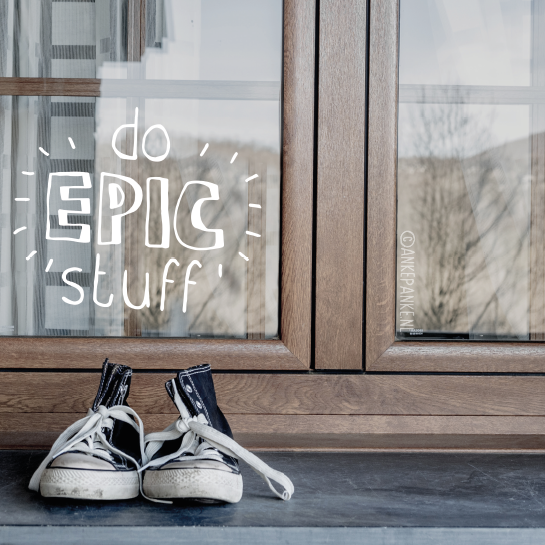 In the Window drawing shop you can get this do epic stuff freebie. Do you have a glass separation at home or at work, for example on your balcony or a glass wall, use this! If it's allowed of course. Draw big and fill the surface, or create a border. Ok! The holidays are done. 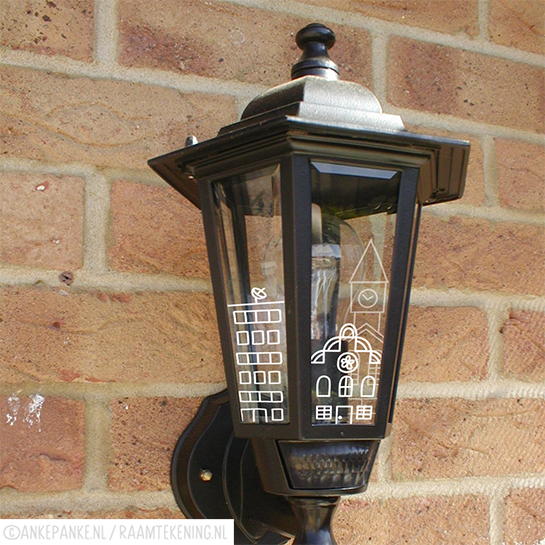 Time for something new on your windows! Want to keep the cosy, winter feeling? 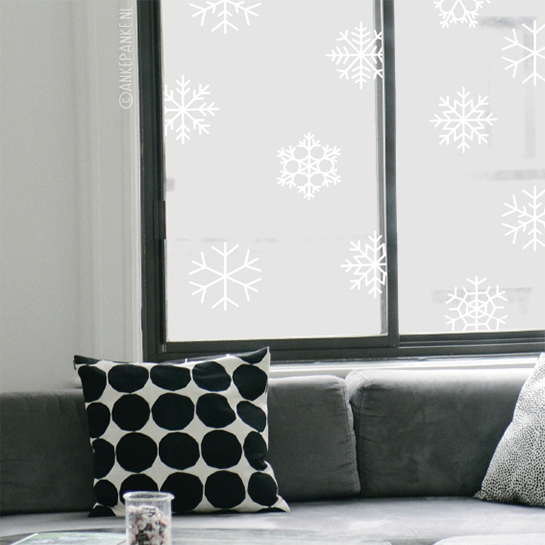 At the Window drawing shop you can get this fun snowflakes freebie. 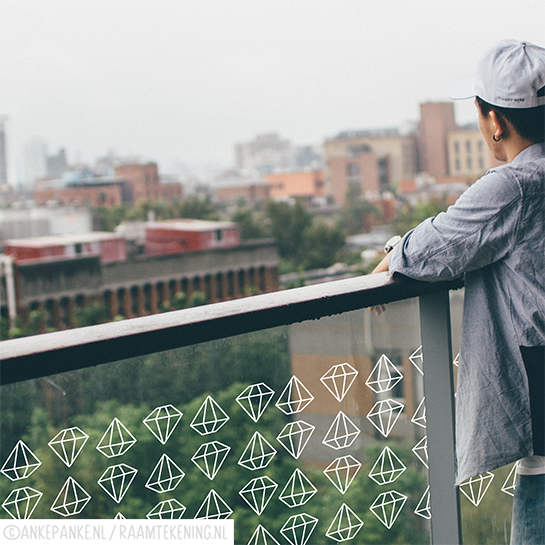 Look around your house/appartment, are there any other smooth, transparent surfaces? I recently discovered a window above my bedroom door. I hadn't realised that I could of course draw on there too! Some doors also have windows. Inside the house or the ones leading outside/garden. 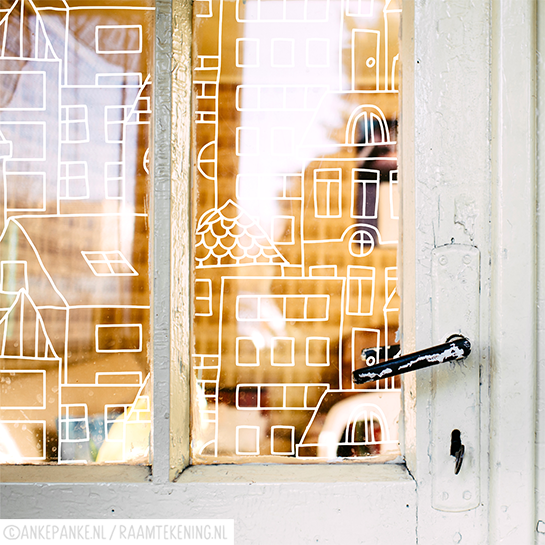 The house window drawings are great all year long, but you can easily make the extra christmassy. How? 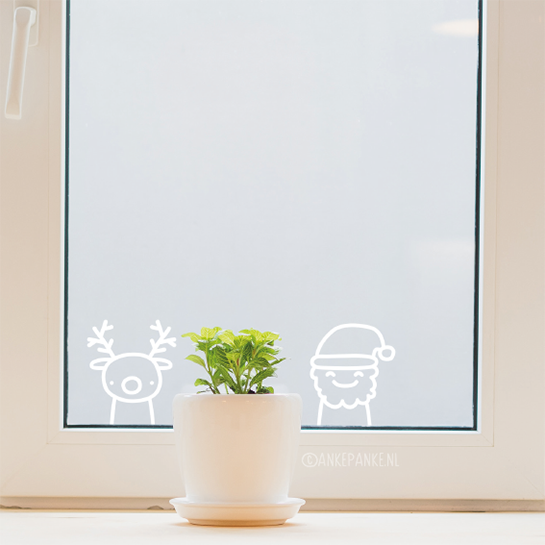 Get the fun santa + reindeer freebie from the Window drawing shop. 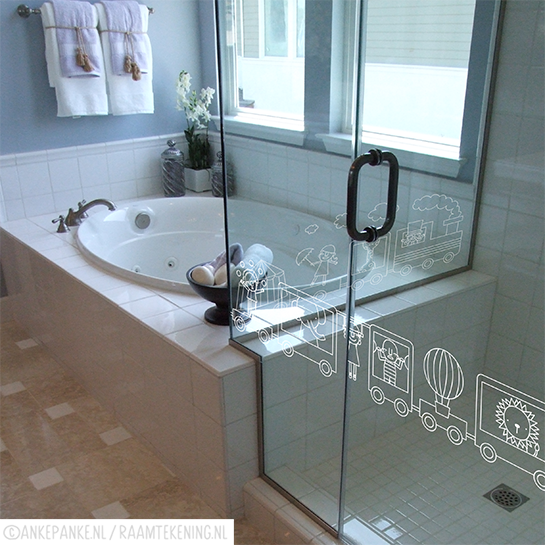 Create your own window drawing in just 5 simple steps! Print a ready made design and start tracing. Fun to do for/with kids! Would you like to ask something, have a tip or just want to say hi? Please do! I love getting mail. Send a message to info@raamtekening.nl and I will respond as soon as possible.